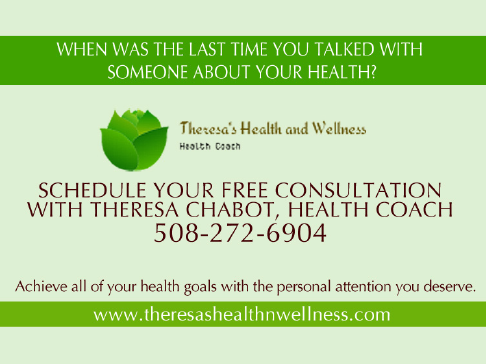 Health and Nutrition Coach Theresa Chabot joins the Health and Nutrition Channels on eHealth Radio. Theresa is passionate about helping people learn how to live a long healthy life by educating them on how to choose the right foods and why, and how to enjoy eating healthy so that they can rid themselves of being sick, and or overweight. What is a health and nutrition coach? What made you become a health and nutrition coach? What do people mean when they say make a lifestyle change, vs dieting? What is the most important key to losing weight? What tips do you have that people can put into practice right now? How can people learn more about your coaching, and how can they reach you? Do you only conduct sessions in person? Theresa Chabot has an Under Graduate Degree from Providence College as well as Nutritional Education from the Institute for Integrative Nutrition, in holistic nutrition. Theresa is certified by the AADP. She has specialized training in hormone imbalance. She also works with children as well as adults to accomplish their weight loss and health goals. She does pre-screening for pre-diabetes, and will help those who have pre-diabetes to reverse it through proper nutrition before it is too late. She is passionate about helping people live a longer, healthier life through proper nutrition, and lifestyle change. There are so many illnesses that today we see as part of normal aging, that really are not part of the normal aging process, and Theresa wants to help as many people as she can to understand that they can take control, and age healthy.